DIE Jovis, 17 die Octobris. Committee to consider of Laws expiring, and of the Act concern Leather. 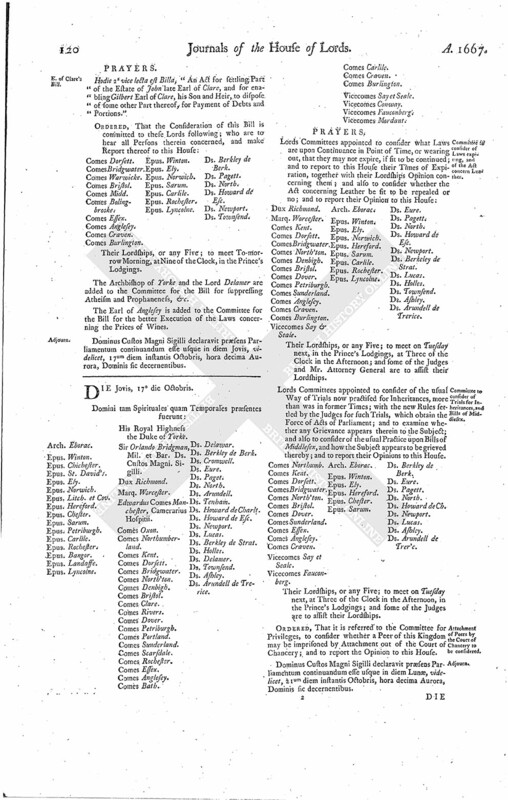 Committee to consider of Trials for Inheritances, and Bills of Middlesex. Attachment of Peers by the Court of Chancery to be considered. Epus. Lyncolne. Sir Orlando Bridgman, Mil. et Bar. Ds. Custos Magni. Sigilli. Vicecomes Say & Seale. Arch. Eborac. Their Lordships, or any Five; to meet on Tuesday next, in the Prince's Lodgings, at Three of the Clock in the Afternoon; and some of the Judges and Mr. Attorney General are to assist their Lordships. 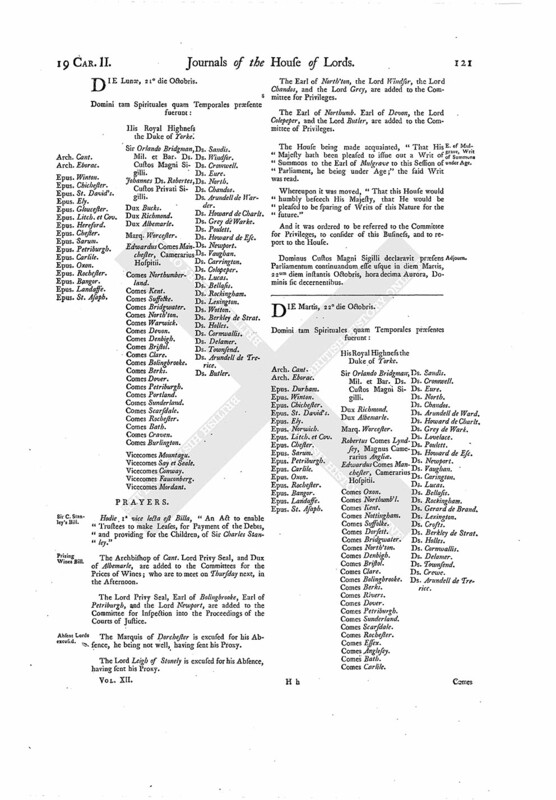 Lords Committees appointed to consider of the usual Way of Trials now practised for Inheritances, more than was in former Times; with the new Rules settled by the Judges for such Trials, which obtain the Force of Acts of Parliament; and to examine whether any Grievance appears therein to the Subject; and also to consider of the usual Practice upon Bills of Middlesex, and how the Subject appears to be grieved thereby; and to report their Opinions to this House. Epus. Sarum. Ds. Berkley de Berk. Their Lordships, or any Five; to meet on Tuesday next, at Three of the Clock in the Afternoon, in the Prince's Lodgings; and some of the Judges are to assist their Lordships. ORDERED, That it is referred to the Committee for Privileges, to consider whether a Peer of this Kingdom may be imprisoned by Attachment out of the Court of Chancery; and to report the Opinion to this House. Dominus Custos Magni Sigilli declaravit præsens Parliamentum continuandum esse usque in diem Lunæ, videlicet, 21um diem instantis Octobris, hora decima Aurora, Dominis sic decernentibus.